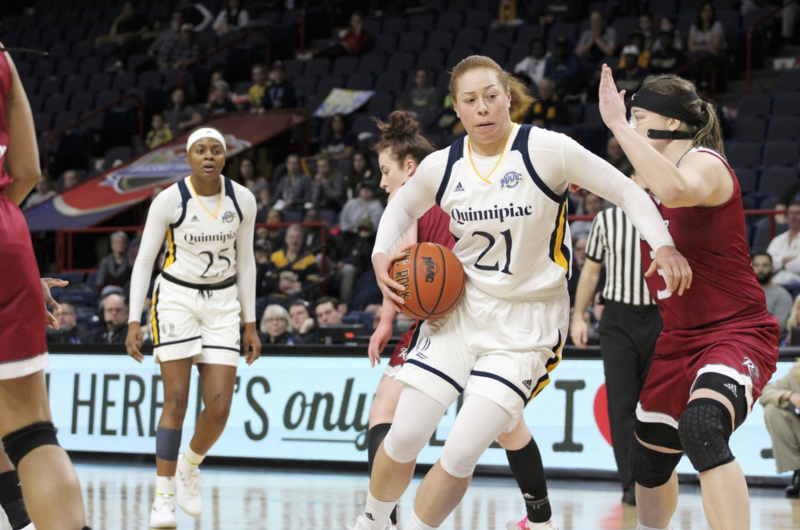 Quinnipiac women’s basketball is establishing cornerstones for long-term success. 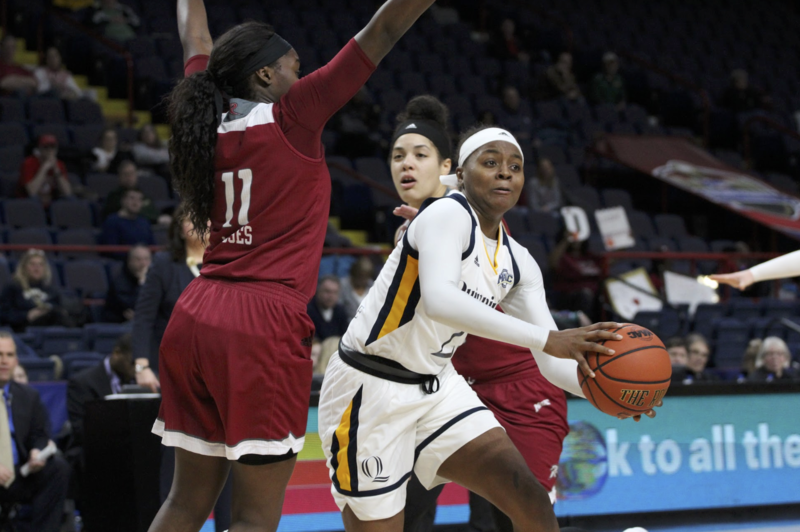 March 25, 2017: The final buzzer sounded in Stockton, Calif. Head coach Tricia Fabbri, sophomore Jen Fay, freshman Taylor Herd, and the entire Quinnipiac Bobcats women’s basketball team took a fleeting glance at the scoreboard. The players shook hands with the eventual national champions, made their way through the Stockton Arena tunnel, and walked through the doors of the locker room door marked “VISITORS.” For most other teams in their situation, a 42-point loss in the Sweet Sixteen would be quickly followed by pounding lockers, frustrated yelling, and crippling embarrassment. For the Bobcats, however, there was no yelling. And there certainly was no embarrassment. The Cinderella story that both drew the eyes and tied the tongues of college basketball fans everywhere couldn’t help but step back and appreciate how far they had come. The most vital stretch for the Bobcats, however, was yet to come. Throughout the history of March Madness, there are numerous cases of mid-major schools that take down a perennial powerhouse from a Power 5 conference (ACC, SEC, Pac-12, Big Ten, Big 12), only to underperform in the following seasons. An unforeseen tournament run results in a rapid increase in attention from national media not only during the tournament but in the months after—some mid-major teams simply crumble in the spotlight. The way the team approached the offseason would determine if they would become a tournament mainstay or be reduced to a one-season wonder. Just as the Bobcats surprised people on the floor, they proved to be impressive off of it, as well. The increased media spotlight not only failed to scare them away—it was used as a source of motivation. The following months were not without adversity, either; the graduation of seniors Adily Martucci and Morgan Manz left the Bobcats searching for that one game-changing individual with the ability to take over. Instead, sophomore Vanessa Udoji and senior Sarah Shewan shared increased roles to start the season in an attempt to limit the blow that the loss of Martucci would provide. For the first five games of the season, the duo found unexpected production. They were drastically exceeding expectations, allowing the Bobcats to pick up exactly where the left off. That is, until a non-conference game with the Richmond Spiders in early December. Against the Spiders, the Bobcats found themselves snake-bitten: two separate plays, two ACL injuries, two gut-punching blows. Just days later, Fabbri announced that the seasons of Udoji and Shewan had come to a premature close. Just months after the biggest emotional high in team history, the Bobcats’ season was quickly turning sour. They were 5-5, they were still without that star playmaker, and they were quickly running out of role players to fill minutes. Though still being tabbed as the conference favorite, the idea of missing out on the NCAA tournament was growing more and more real. Enter: Taylor Herd, Carly Fabbri, and Aryn McClure. McClure, with the losses of Udoji and Shewan, became the dynamic star that the Bobcats were becoming progressively more desperate for. Fabbri took over as starting point guard and quickly became a vocal leader and source of enthusiasm. Perhaps the biggest difference-maker of the trio, however, is sophomore guard Taylor Herd. After seeing a grand total of 47 minutes her entire freshman year, Herd was thrust into a starting role after Udoji went down. Though taking just six shots in her entire rookie campaign, Herd made the transition from the bench to a starting role look almost seamless. Herd was not the only Bobcat who saw an increased role as the season progressed, and she certainly was not the only Bobcat who would have been ready if her name was called. That’s thanks to Tricia Fabbri’s unique five-in, five-out substitution method—a system that players call the “Gold Rush.” Where other teams substitute one or two players at a time, the Bobcats’ unorthodox method ensures that each player gets valuable in-game experience while also keeping everybody rested. “I feel like all of these other teams, their players aren’t getting experience game in and game out. When it’s their time, they might not be ready. With our team, it’s not like that. Everybody is going hard all the time and is always going to be ready if they need to be,” Fay said. Since the injuries, the Bobcats have won a remarkable 24 of their last 26 games; a stretch that includes a 23-game winning streak, an undefeated regular season in the MAAC, and a win against Marist in the conference championship. They’ve done exactly what they weren’t expected to do, given everything that happened after their tournament exit last year—succeed. “I think if you look inside our team, the competitive nature we have in practice with each other and that culture that we have is really where our success is coming from,” Herd said. The culture that Tricia Fabbri and company have established has certainly proven to be a special one. 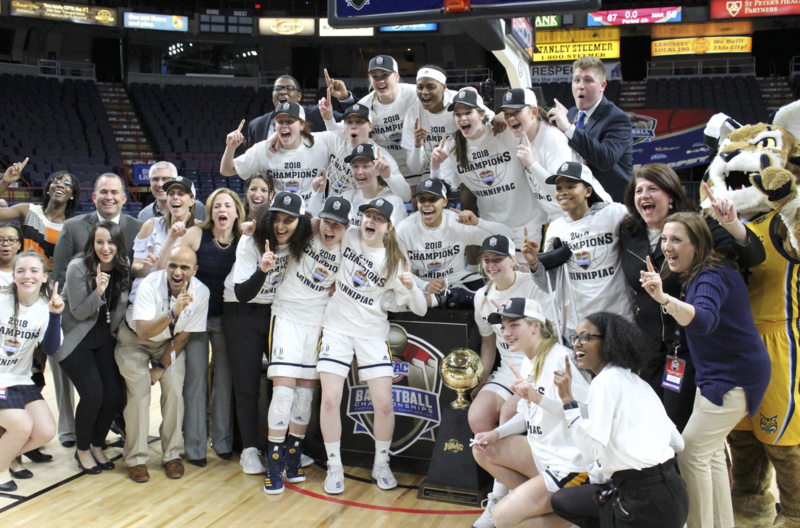 On March 12, better known in the women’s college basketball world as “Selection Monday,” the Bobcats overcame their biggest obstacle they’ve faced as a mid-major—they avoided the classic “mid-major crumble.” Not only did they see their name in the bracket, they saw their name next to a small ‘9’—symbolic of their highest seeding to date. The team that they were paired with in the first round was a familiar foe; the University of Miami Hurricanes, one of two victims that the Bobcats claimed in last year’s tournament. After a nail-biting win in the first round, the Bobcats ultimately fell short of a repeat Sweet Sixteen bid, thanks to a second-round date with Geno Auriemma’s Connecticut Huskies. Despite the early exit, the game with UConn is, in many ways, a microcosm of the program’s recent history. They did better than most college basketball analysts projected, they showed how strong a mid-major team can be, and–most importantly–they refused to back down from a challenge, even with the odds stacked against them. This is not the last that America will hear of the Quinnipiac Bobcats. Like the state park that rests just across the road from campus, as the snow melts, the leaves grow back, and March comes to a close, the Bobcats are doing something may change the perception of a mid-major in women’s college basketball forever.